Compass Box The Peat Monster Reserve (48.9%): This 1.75L comically oversized bottle is kind of the Excalibur of the Compass Box range. The whisky definitely looks handsome in this bottle... I don't think that it is a big secret that the original Peat Monster is a blend of three single malts: Caol Ila, Laphroaig and peated Ardmore all aged in ex bourbon casks. I have been told that the secret ingredient in the 5th year anniversary Reserve edition is coming from Clynelish Distillery aged in new French oak barrels. Only 1325 bottles are released and on top of everything it's abv is boosted. I have a very very good feeling about it. Color: Pale, clear linden tea. Nose: I have to say it is less punchy than the original version. Very sweet burnt peat and pleasing briny sea air. Iodine, dead bonfire on the beach, scuba gear, engine room. With a few drop of water and after allowing a few seconds all the vanilla, banana and guava notes are getting released. I would say it becomes almost floral. Palate: Very salty and spicy. Peat is not leading. Seaweed, kumquat, bergamot, black pepper. Water brings olives, capers and rosemary to the palate. Finish: It is not powerful but long. Starts with baked apple pie, cinnamon. Other spices take over till it finally fades out with sweet smoke and tar. 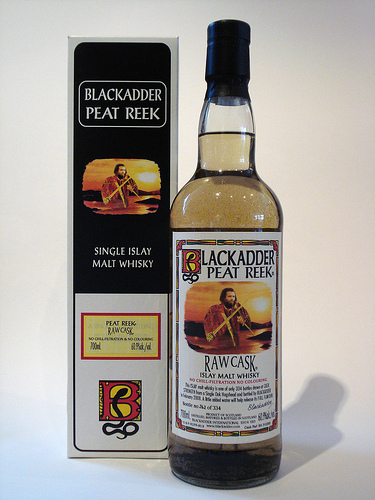 Overall: I couldn't help comparing it all the time with the original Peat Monster but it is a totally different whisky. It's definitely rounder, sweater and reacts much more to a few drops of water addition. Surprisingly I found warm and calm Mediterranean breeze in this expression instead of cold and restless North Sea air. It's another great creation from John Glaser.